Background Service offering management is your menu or catalog of services provided to the end-user community. This defines the extent of your IT capabilities, policies, service levels, price-point and support commitment. The development and administration of a service catalog requires significant insight into application requirements, technology infrastructure, cost allocations, terms-of-service arrangements and performance-support commitments. Typically, IT management and staff do not have the depth and breadth skills to analyze these disciplines and develop the service offering commitments required to fulfill end-user requirements. Given the operating costs and impact on business operations, improved strategies and management of service offerings is an untapped opportunity for most organizations to improve service delivery. Our Mission is to provide an in-depth third party review with attention to balance, accuracy and completeness. 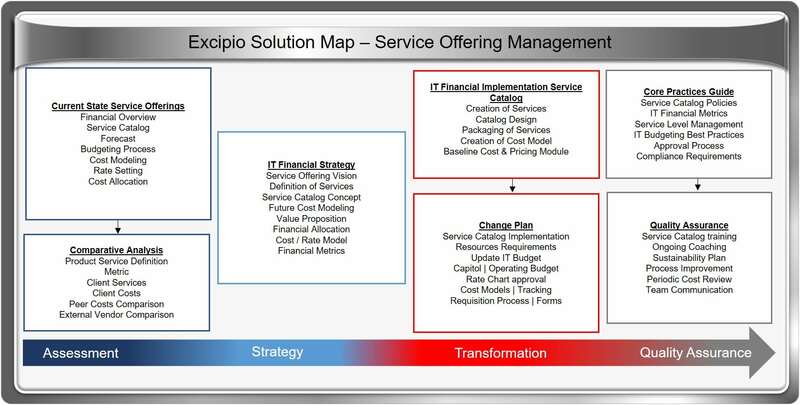 Excipio is vendor neutral we do not sell or refer technology, support systems or related services thus we can be completely objective in our analysis and recommendations. The following diagram illustrates our professional service offering, life cycle methodology and solution deliverables. Where do we start? We intuitively begin with a review of your current operations environment. Once we understand the value of your dependencies by operating load, organizational efficiency, and cost structure, we move to analyze your release levels, data center facilities, disaster recovery capability and potential optimization and or future outsourcing opportunities. Why are These Solutions Needed? 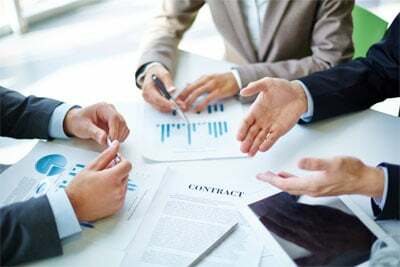 To justify IT capital budgets and operating expenditures for human resources, data center facilities, infrastructure technology, and application support. This kind of analysis and strategy requires a combination of strong financial skills, technical insight, process experience and audited benchmark data. Typically IT does not have the skill-set, formal methodology, and seasoned benchmark data to conduct this type of analysis. The result is opportunity identification and path forward approaches that executives can utilize to determine viable and unified strategies supported by fact-based information. Our expertise and maturity level is based on 100 plus IT operation management engagements over the past 10 years. For more insight into the success of our clients, please contact us at sales@excipio.net for a straight-forward discussion on how our solutions could dramatically optimize your IT resources.